Think reusable bags are only to be used at grocery stores? Think again! Zero Waste Communities is here to give you 4 simple tips to get the most out of your reusable bags this holiday season. 1. Reusable bags aren’t just for the supermarket. We all like to get the most value out of our purchases—especially during those holiday sales—but there’s one complimentary item that you shouldn’t feel cheated by turning down at the register: a shopping bag. Using your reusable bag collection for your general holiday shopping will help cut down on numerous wasted disposable bags from department stores. Not only will you produce less waste, as a bonus when you bring your treasures home your giftees won’t know what stores you’ve been to. For those nervous about being the odd-shopper-out, for five years Heal the Bay has coordinated “A Day Without A Bag” on the third Thursday of December—the 15th this year—where holiday shoppers and retailers forgo single-use plastic shopping bags in favor of reusable bags. 2. Think outside the box; right outside the box. A lot of effort goes into making our presents look like presents. All that colorful paper looks great, but did you know that wrapping paper and shopping bags alone account for about 4 million tons of trash annually in the US? Most of us probably know that with a little bit of extra effort and care, even the most delicate of wrapping papers can be saved or passed on to wrap again. While that’s fantastic, with a little creativity, resourcefulness and research you can blur the line between wrapping and wrapped. There are a lot of sites that offer some great ideas for good looking reusable packaging or how to make the packaging itself, a part of the gift. 3. That’s your bag, Baby. Sometimes, you don’t even need to put anything inside of the bag. And why should you? 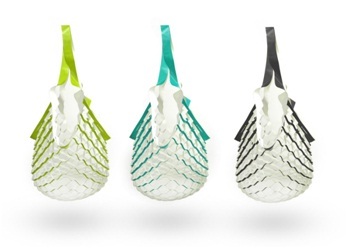 If you happen to find a really awesome bag that you think your friends and family would love to carry and use week after week for their shopping or personal needs, that’s definitely a gift worth giving. Just don’t try to say it’s the same thing as a purse. Even thought it kind of is, that could to get you into trouble. 4. Bags? We don’t need no stinking bags. 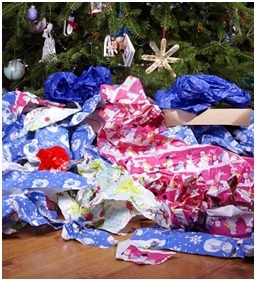 If you really want to get serious about using less, don’t wrap or bag your gifts at all. You’ll even get bonus points if the gift itself is made to be reusable or made from recycled or reused material. You can carry small purchases home in your hand, purse or pockets. Once you’re back home, if you want to get more festive than presenting your gift by saying, “Here you go,” find places to hide them: under a pillow, in a tree or in the refrigerator. Be creative, but don’t forget the tried and true behind-your-back technique. Mostly, we hope that you’ll join with Zero Waste Communities in committing to a simpler but no less magical holiday season. Do you have any gift-giving and material-saving ideas? Share them with us!